Nairobi - A draft United Nations report says the Rwandan army and Congolese rebels killed thousands of Rwandan Hutus in a revenge campaign during the 1990s that could be classed as genocide. The report by the UN High Commissioner for Human Rights, leaked to the media, details how the Rwandan army and associated rebel groups systematically targeted Hutus in the Democratic Republic of Congo from 1993-2003. 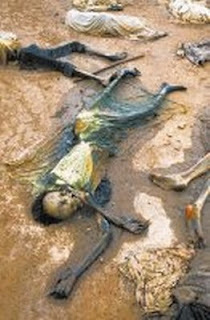 Around one million Hutus fled to DR Congo after the 1994 genocide in Rwanda, during which Hutu militia slaughtered 800 000 ethnic Tutsis and moderate Hutus. The report said that checkpoints were set up to identify Hutus and eliminate them in DR Congo, which was formerly known as Zaire. Among the victims were women, children and the elderly. Recently re-elected Rwandan President Paul Kagame, who led the rebel group that ended the genocide and seized power, is likely to be angered by the claims. The genocide is still a sensitive subject in Rwanda. Opponents of Kagame have been arrested on charges of genocide denial for suggesting Tutsi forces carried out massacres in the aftermath of the slaughter.